A prestigious interior design project for the Elements of Byron Resort, featuring Bisazza mosaic, has been shortlisted at this year’s SBID International Design Awards in the Hotel Design category. The Society of British International Design (SBID) is the professional accrediting organisation for the interior design industry in the UK. The organisation is part of a global network of 50,000 designers who are professionally accredited. The closing date for the public voting will be on Friday 16 September 2016 at 5.30pm GMT. Created especially for use in or around water, there is a new, luxurious alternative to white gold. 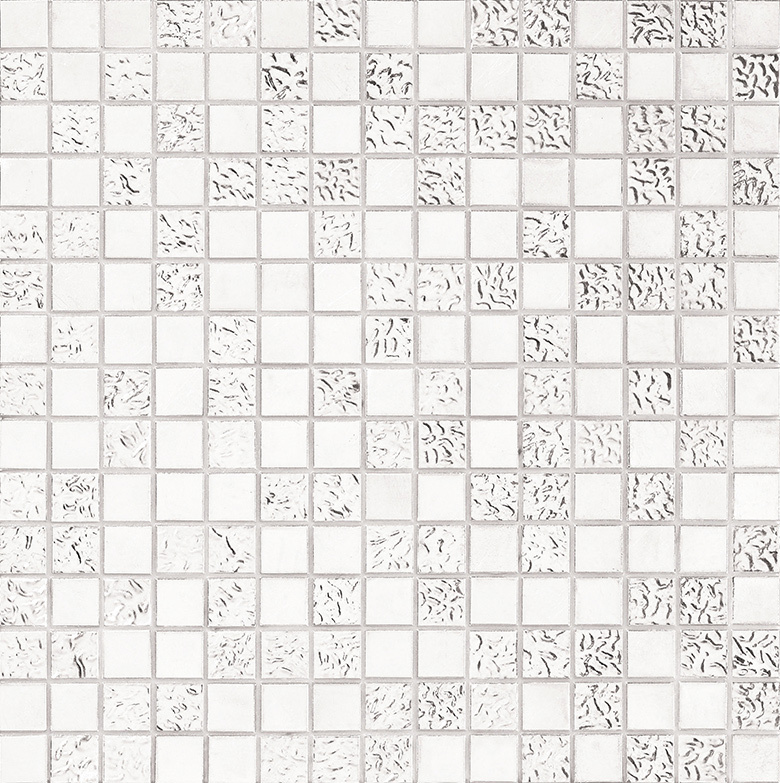 Bisazza’s new Platino mosaic offers the same exclusivity, but with a total guarantee against oxidisation. The tiles are composed of 100% platinum - nothing else - which means they can even be trimmed or cut to size and still remain impervious to the effects of water. The purity of the mosaic’s composition also means that the tiles have a completely uniform colour, for an added touch of perfection. Platino mosaic is available in the Bisazza BIS version with a small bevel (the ‘wall’ configuration), in 20x20mm and 10x10mm sizes and with a choice of smooth or undulating surface texture. Platino mosaic tiles are presented with a certificate of authenticity, which validates their composition – 100% platinum – and provides a total guarantee for their use in water. Platino can be specified as a replacement for Oro Bis Bianco (white gold) in any Bisazza blend, shading blend or decoration, as well as any personalised designs, at no additional cost, for areas where mosaic designs come into contact with water or are completely immersed. In swimming pools, showers and very humid environments such as saunas, new Bisazza Platino will completely prevent oxidisation. Central to Marcel Wanders’ design concept for the Mira Moon hotel in Hong Kong is the legend of the Chinese Moon Festival. 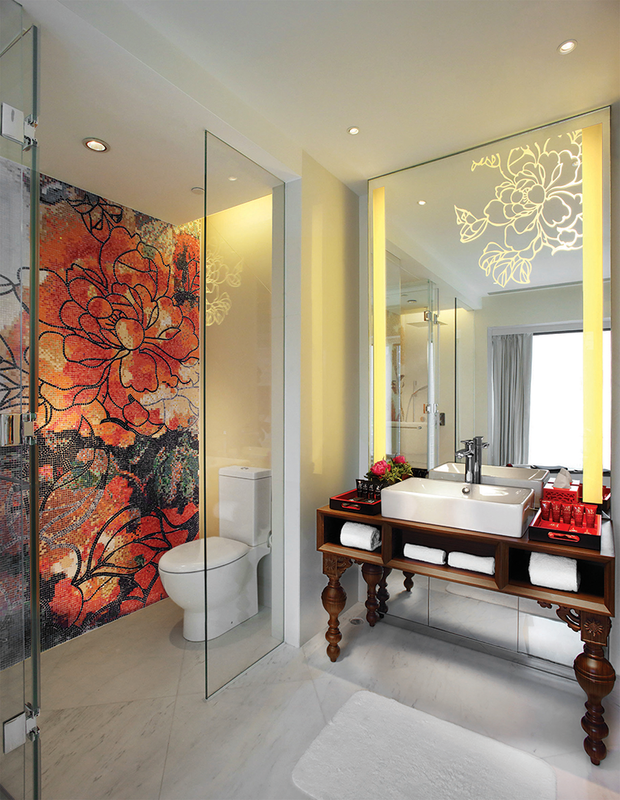 Exploring traditional Chinese art and culture but with a contemporary twist, Wanders make startling use of Bisazza mosaic, recalling traditional Chinese painting techniques. From soft and subtle watercolour-wash to vibrant floral hues and contrasting black outlines, Bisazza mosaic lights up Marcel’s design in spectacular fashion. 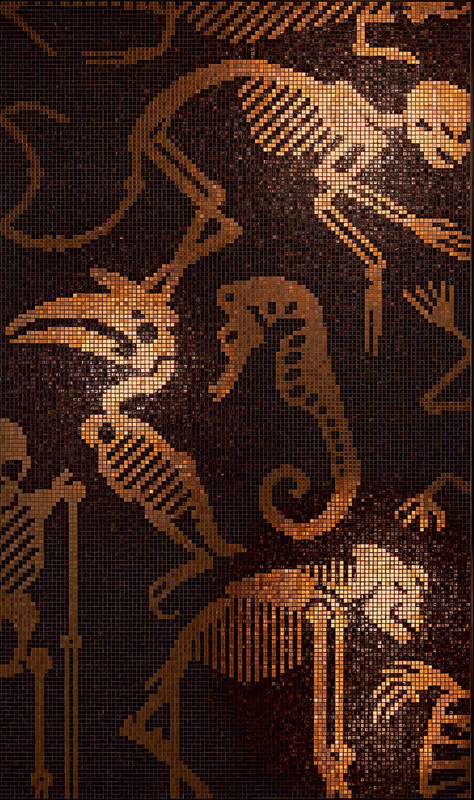 Using a digital design technique for the Mosaic areas, Marcel truly pushes the medium into breathtaking new territory. Characters from the Moon Festival tale are represented throughout the hotel’s many vistas, creating a potent cultural experience, whilst referencing a modern yet welcoming colour palette of orange, brown and light green. 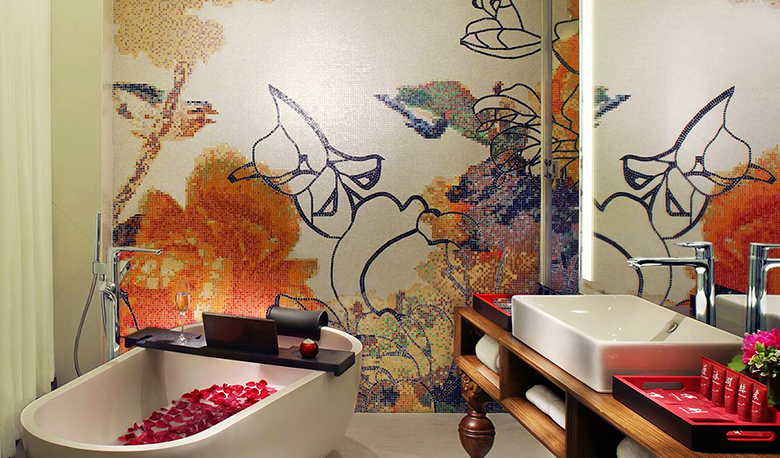 Marcel Wanders and Bisazza have created for Mira Moon one of the most distinctive, vibrant hotel interiors in the region. If you’re passing Causeway Bay, why not take a look for yourself? Mira Moon Hotel. I am pleased to advise you that Dean Seketin has joined Bisazza as our Business Development Manager for Queensland, Northern Territory and Western Australia. Dean comes to Bisazza possessing a diverse and extensive sales and technical skillset mix, gained during the last 15 years working locally and overseas within the tile industry. Dean holds a Certificate IV in Construction Management, a Trade Qualification in Wall & Floor Tiling and a Diploma in International Business. Dean was heavily involved in the installation of a vast variety of tiles in prestigious and landmark projects throughout Brisbane and Gold Coast, progressing on to focusing and excelling in customer relations and customer service, where he found his true calling. Dean's positive attitude and involvement in projects led him to China, where he was responsible for developing the tile installation systems for modular housing built in China for the Australian market, with particular focus on the latest Australian Standards and Building Codes. 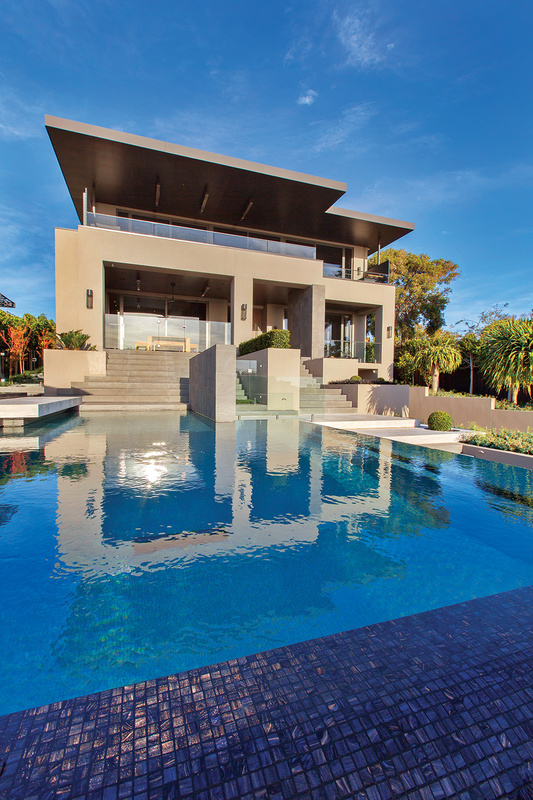 Dean then progressed to a Business Development Manager role at a tiling organisation in Queensland, where he was solely responsible for the total sales operations, building a network of key construction professionals and working closely with designers and architects on prestigious projects. Dean has a very strong focus on providing exceptional service to all his customers, who can be confident in his extensive technical knowledge and approachable manner. Dean will now become the point of contact for any matter relating to Queensland, Northern Territory and Western Australia. 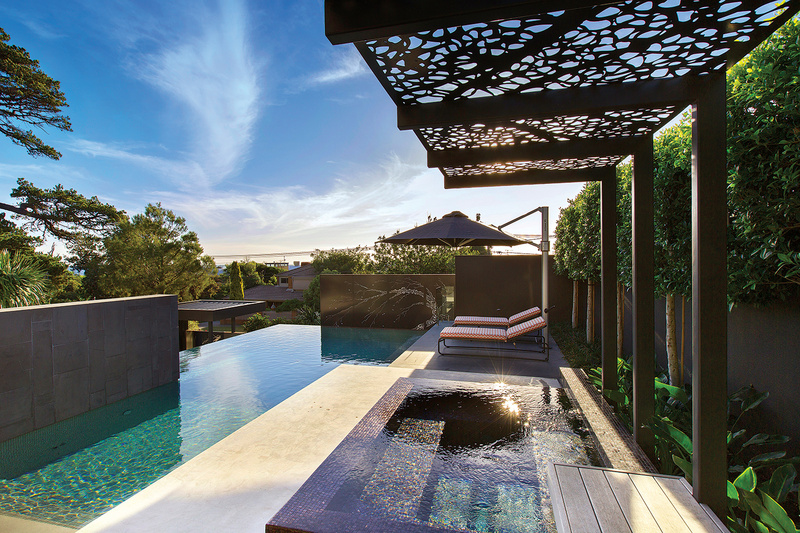 With his signature flair and technical expertise, Steve Taylor of COS Design provided a truly breathtaking solution for the owners of this modern, Melbourne home with incredible views of Port Phillip Bay. 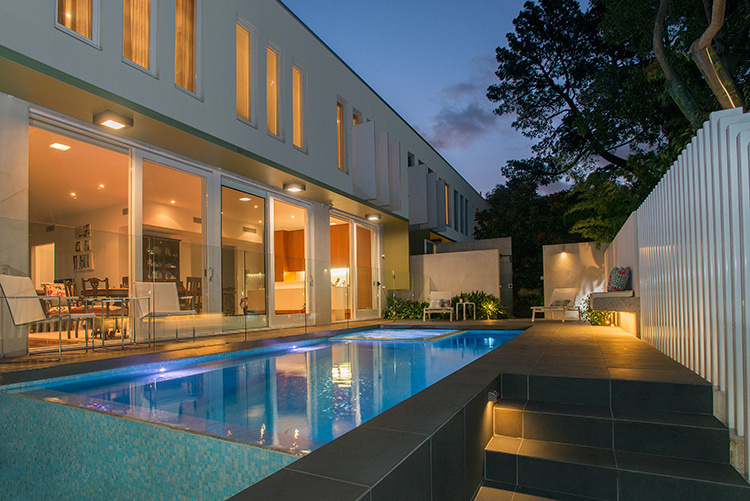 With 17m from street to door and a vertical drop of 5.1m, the space has been extensively terraced, placing the pool as a central part of the guest entrance experience with the incorporation of a large acrylic window. The views of the pool from the balcony above are equally amazing, particularly as the spa doubles as a night-time reflection pond. 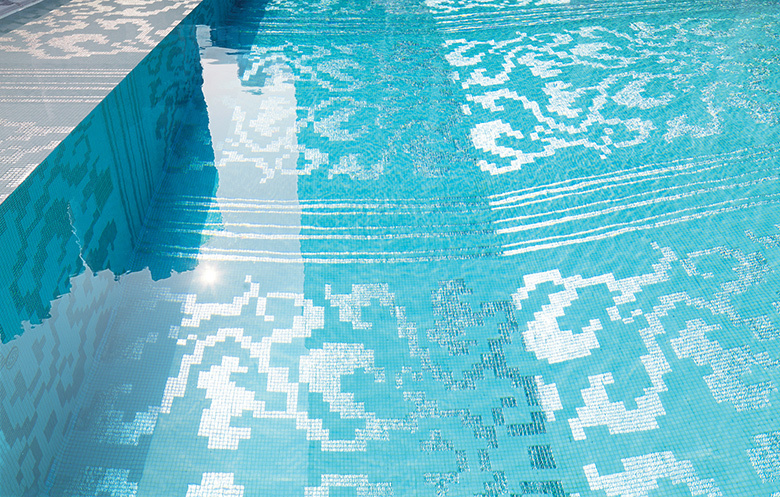 His discerning clients having the highest expectations, Steve and his team concluded that only the very highest quality mosaic would do justice to the beautiful pool and spa, specifying Bisazza Gemme mosaic (GM20.77) for the spa and Bisazza Vetricolor (VTC 20.56) for the pool. Credits: Design: C.O.S. 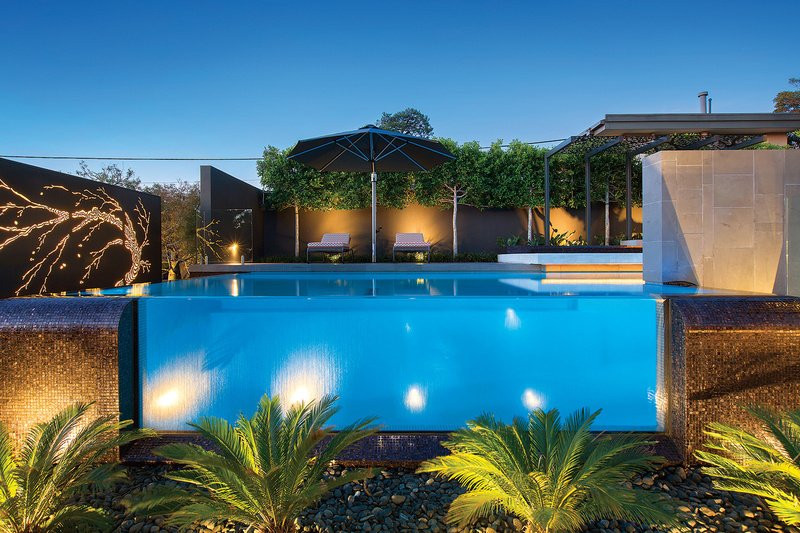 Design - cosdesign.com.au, Builders: Atkinson Pontifex - atkinsonpontifex.com.au, Landscaping: Hamilton Landscapes - hamiltonlandscapes.com.au, Photography: DPI Photography - dpi.net.au, Mosaic: Bisazza - bisazza-australia.com.au. To complement the Oro Bis collection of yellow and white gold mosaic, an entirely new Rose Gold option has been created for 2016. As with the other Oro Bis mosaics, the 24kt gold leaf is hand produced in Florence using a traditional craft method of beating the gold ingot with leather straps. This gold is then gathered up and encapsulated in fine silica glass, to which a red resin has been added. The resulting Rose Gold is a brand new twist on gold mosaic, with a warmth and sophistication all of its own. 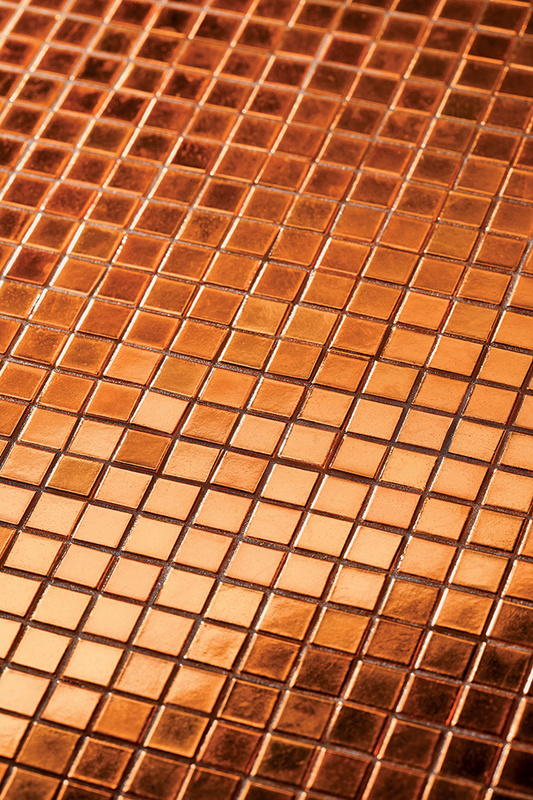 The new Bisazza Rose Gold mosaic is finished with either a smooth or wavy surface, at a size of 10mm x 10mm. Rose Gold is available as part of the Bisazza 2016 Collection. 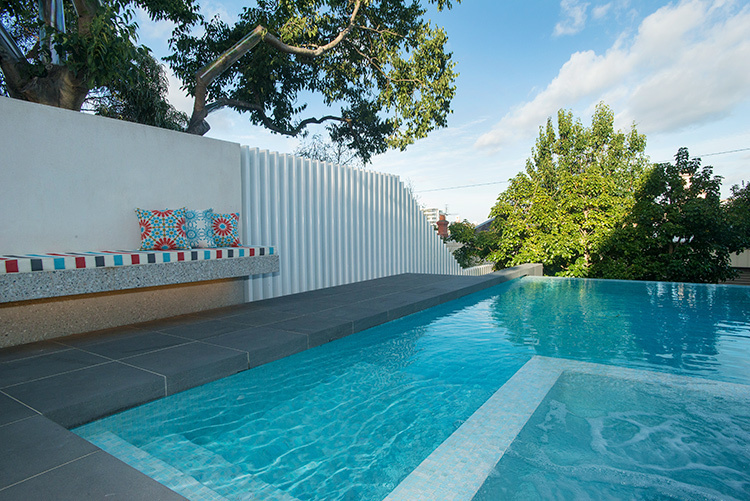 Designed and installed by the accomplished Melbourne pool company 'Out from the Blue,' the wet edge swimming pool and spa makes beautiful use of the subtle, blue-green hues of EMANUELA from the Bisazza blends collection. In spite of some very strong competition, SPASA Victoria judged the pool to be best in its category at the recent 'Awards of Excellence' and presented the Gold Award to OFTB. 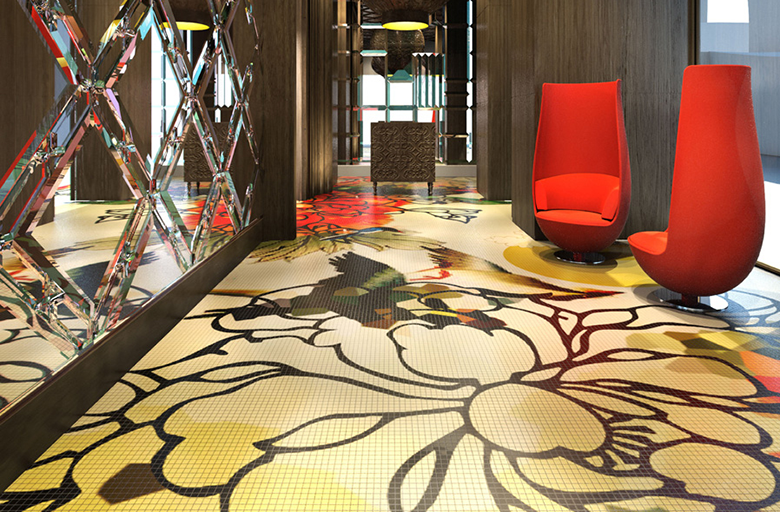 of the original TULIPS by Marcel Wanders. Set on a contemporary, neutral background, Marcel's gigantic, swirling, brightly coloured Dutch tulips spring to life in vivid reds and pinks, yellows and oranges, adding a vivacious quality to any room. In truly innovative Bisazza style, the design also brings together two contrasting techniques. 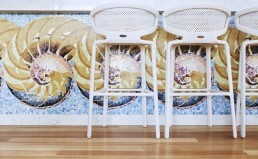 The background pattern is a contemporary digital design, formed from 10mm x 10mm mosaic. The colourful tulips are skilfully hand-cut and placed using premium glass enamel mosaic, positioned over the background to form the finished design. This combined technique allows the designer more freedom, so the tulips can be positioned to perfectly suit the environment. 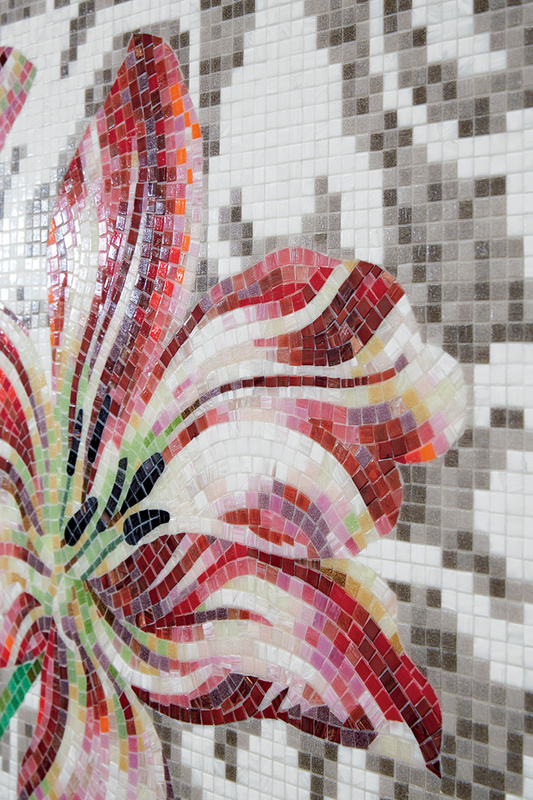 And of course, every mosaic piece is 100% pure Bisazza. Tulips Grey is available as part of the Bisazza 2016 Collection. Drawing inspiration from the delicate Messein porcelain of 18th Century Germany, Carlo Dal Bianco has created CHINOISERIE, a romantic and magnificent decoration mosaic collection. Europe in the 18th Century was infatuated with a dream-like, idealistic concept of the Far East. The original Chinoiserie became a very popular trend which was most famously depicted in decorative porcelain tableware of the period. Carlo Dal Bianco's 'imagined' China however, is manifested in six, beautiful panels which depict the characters and scenes of an antiquated Asian life. 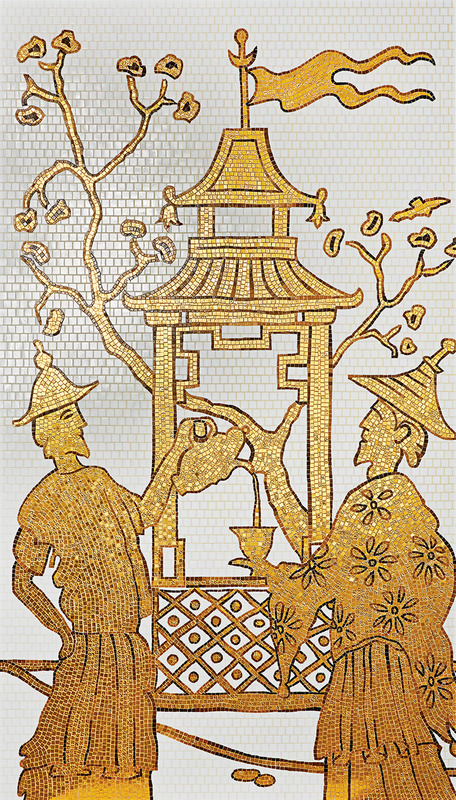 Exploiting a combination of techniques, the images are created in sumptuous, 10mm x 10mm, 24k gold mosaic tiles, handmade using the famous Bisazza 'artistic technique.' These lie resplendent against the digitally created white mosaic background. I love mosaic. It's a technique that's part of me, like drawing, and I use it as an expression of the beautiful things I'd like to surround myself with. It's an ongoing personal research as an antidote against mediocrity. It's an extraordinary matter, shiny and full of personality. It's a little thing which can arouse big emotions. 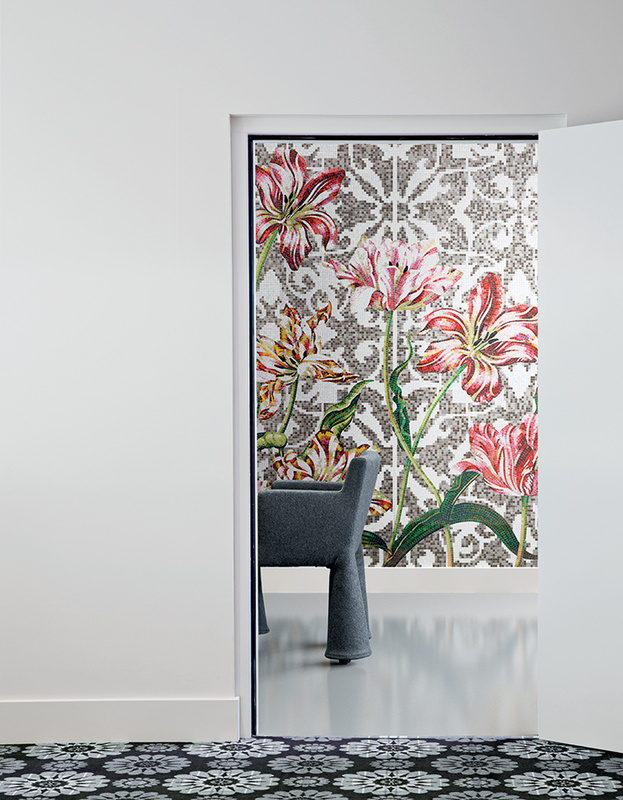 CHINOISERIE will be available as part of the Bisazza 2016 Collection.